'The Sunday newspaper of the air' was how BBC Home Service controller Gerard Mansell described The World this Weekend when it launched on 17 September 1967. 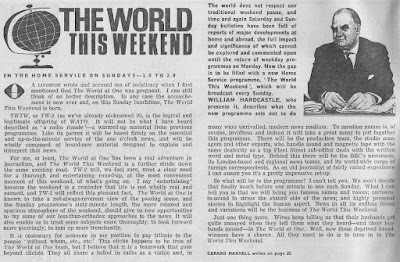 A spin-off of the successful The World at One that had been on-air since October 1965, the Sunday lunchtime version shared the same DNA as its weekday stable mate, with the formidable team of presenter William Hardcastle and editor Andrew Boyle. Mansell, writing in the Radio Times, explained further: "Sunday journalism has long been a prominent feature of the British scene. In fact, more Sunday papers are published and read in this country than elsewhere in the Western world. Yet, oddly enough, radio has not up till now provided its own 'Sunday newspaper of the air'. At the weekend, with the exception of News Bulletins and Radio Newsreel, it has tended to 'soft pedal' Current Affairs. 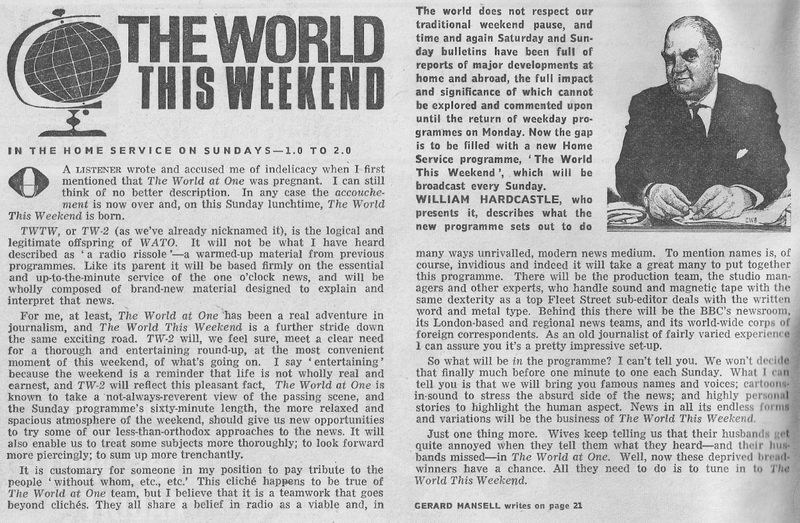 Now the gap is to be filled with the new Home Service programme The World This Weekend..."
Writing in the same issue William Hardcastle (see article reproduced above) assured listeners that the new programme would not be a "radio rissole - a warm-up material from previous programmes. Like its parent it will be based firmly on the essential and up-to-the minute service of the one o'clock news, and will be wholly composed of brand-new material designed to explain and interpret that news". From the start, and for many years, The World this Weekend had a full hour which, according to Hardcastle, together with "the more relaxed and spacious atmosphere of the weekend, should give us new opportunities to try some of our less-than-orthodox approaches to the news. It will also enable us to treat some subjects more thoroughly; to look forward more piercingly; to sum up more trenchantly." For listeners in the 1970s and 80s the voice most associated with The World this Weekend was Gordon Clough, indeed he was the programmes sole presenter for nearly a decade from 1976. The earliest recording I can track down is from 16 September 1984 with Clough at the helm, the news read by Eugene Fraser - leading on the naming of Prince Harry and the ongoing miners' dispute - and an interview with Energy Secretary Peter Walker. The regular presenters over the five decades have been: William Hardcastle (1967-69), Anthony Howard (1969-71), David Jessel (1970-71), Nicholas Woolley (1971-75), Gordon Clough (1972-91), John Sergeant (1987-88), Nick Clarke (1989-94), Roger Hearing (1991-92), Susannah Simons (1991-92), James Cox (1992-2005), Shaun Ley (2005 to present), Brian Hanrahan (2006-10) and Mark Mardell (2014 to present). Whatever Happened to Radio 2?